Taking its name from one of Dave Brubeck's most famous tunes, Dave Brubeck: In His Own Sweet Way is a reflective look at the personal story of the influential jazz pianist and composer. 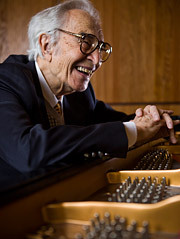 Known just as well for his improvisational skills as he is for unusual time signatures, attendees will get a glimpse into Brubeck's prolific career. Dave Brubeck: In His Own Sweet Way was directed by Bruce Ricker and Clint Eastwood served as Executive Producer. Alec Baldwin is the narrator of the film. The screening will take place in the 200-seat Clive Davis Theater and a performance by the Brubeck Institute Jazz Quintet will immediately follow. This program, part of the Museum's Reel to Reel series is presented in conjunction with University of the Pacific's Brubeck Institute and KCET.